Can't find the right mural or wallpaper to suit your decorating plans? Create your own wallpaper using Resene WallPrint. Simply upload your high quality photo (a holiday destination, family photo or artful composition) or choose from a gallery of images then adjust the scaling to create a perfectly sized feature wall. Once you've finished your design, Resene WallPrint is printed onto wallpaper. Each strip is numbered so simply paste the wall, hang the wallpaper and enjoy your one-of-a-kind wall. Simply click on the 'Start designing' button below and follow the steps. Resene WallPrint cost is $75 inc GST per square metre, including delivery to your nearest Resene owned ColorShop. We've gathered together the most commonly asked questions about WallPrint. If you have any other queries please let us know by emailing update@resene.co.nz with the subject header 'WallPrint'. How does the process work to order a Resene WallPrint? You create your Resene WallPrint using our WallPrint programme. Then we check and confirm the order with you. You arrange the payment for the order and once the payment is received the order is placed. Generally once payment is received printing takes around 15 working days depending on the complexity of the project and the workload. Once printed the completed order is delivered to your local Resene ColorShop for collection. The minimum order we can supply is 3 square metres. If your project is smaller than this, it can be supplied, but a minimum charge of 3 square metres will apply. Is there a minimum size? The minimum size for a WallPrint is 3 square metres. The system will not let you design a WallPrint smaller than 61cm wide and 127cm high. If you try entering smaller than this the system will alert you. What sort of image do I need? The image needs to be high quality to ensure that it will print well. Generally for most WallPrint projects a file size of at least 3mb is needed and for large walls, a file size of 5mb+ may be needed. When you enter an image into the WallPrint programme it gives you details on viewing distance. If you want the WallPrint to be viewed close up you will need a better quality image. For a large wall, 25% of the total actual size of the end product is ideal and should not return a low resolution warning. You can make the image uploaded the actual size, but bear in mind the upper size limit for an image upload is 500MB. Can you adjust parts of the image in the Resene WallPrint tool? The WallPrint tool lets you make the image wider/taller to fit the wall. However it can't change any elements of the image itself. This would need to be done outside of the Resene WallPrint tool using something like Photoshop. The best idea is to upload an image into WallPrint and try out the options so you can see how your image would look and what other changes you may need to make. I want to do wallpaper using a specific image. How do I check the resolution is ok? The wallart tool requires a minimum of 300 dpi. When you load up an image into the tool, it will analyse the image and let you know how pixelated the image will appear from a viewing distance of 1.8m. If the image will be pixelated, it gives you a warning and the distance from which it will not appear pixelated. Obviously the further away from the image you are, the less pixelated it will appear. Also built into the tool is the ability for you to print out an A4 sample to the full scale you are after. You can print this out on your own printer and specify exactly which part of the mural you want to print out. How do I account for obstructions, such as doors and other items? Use the shape tools in Resene WallPrint to mark out any obstructions you have on the wall you are planning to have the Resene WallPrint on. Just set the size to the same size and position as the obstruction you have. Is my image checked prior to printing? A check is done by the printer before printing to make sure the image isn't too pixelated or offensive or breaching any copyright. The WallPrint programme gives you the ability to print a 100% scale sample (A4 sized) so you can gauge the quality of the print at full size. You can even pick where the sample is taken from within the image. How do you install WallPrint? Resene WallPrint is a paste the wall paper so can be installed as with a normal paste the wall paper. Full installation instructions come with the WallPrint when it is delivered. Click here to view the installation instructions. Does the WallPrint come with the door or window area already cut out? The mural is printed as a full square/rectangle piece and the installer trims around any doors or windows, just as they would with wallpaper. If your image is pixelated you can print off a sample to help you decide whether to progress with your order. 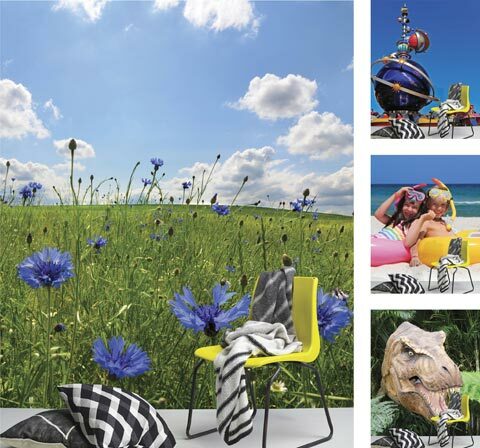 The Habitat wallpaper book available from Resene ColorShops has a physical sample of the Resene WallPrint printed paper. Does WallPrint check the image is ok? Once an image is added it is checked for its suitability regarding the project size, e.g. what is the size of the wall? The quality of the image needed will depend on how large you want to print it. If the image isn't considered good enough (file size wise), a warning yellow triangle is displayed on the right top of the screen. Clicking on the triangle provides more information. It tells for example what would be the requirements for such a wall/canvas. Also, at which viewing distance that image would be acceptable. For example if the image is to be seen at a distance, then it may still be acceptable to have a less sharp image than if it was being viewed at close range. Can WallPrint be used ok in a bathroom? The product can be used in a bathroom as long as the preparation is done properly. This means pigmented sealer, size and proper pasting. When I load my image does that mean other people can use it? No. The image you load is only available to you.